A sturdy and stylish frame for your living room or patio. Supports single-point hammock-style swings and chairs (max height of 54”). Compatible with Soft Comfort Swing Chair. Suitable for indoors or outdoors. Intended for home use. For light swinging only. Includes carabiner. Holds up to 275 lbs. Weighs 53 lbs. 44.5”L x 79”H x 31”W. 84” from top of hook to floor. 100% steel with powder-coated finish. single point and 2-point suspension swings. Includes 3 carabiner clips to hook swings to frame and attached rotational device for 360-degree spinning. Weighs 90 lbs. Holds up to 450 lbs. and a 5,000 lb. working load. 12’4 front to back. 10’8 side width. Recommended ceiling height 7’10 and swing area 16’ square. 3 year warranty for metal frame. 2 year warranty for fasteners and other pieces. Have limited space for a swing? This wall-mounted frame is the perfect space-saving solution. When not in use, simply fold it up against the wall. Supports single and 2-point suspension swings. Fits spaces as narrow as 10’ x 16’ and attaches to walls 8’ or higher. For lower ceilings, swing frame height can be customized at no extra cost. Complete package includes 6’ swing arm, steel arm re- ceiver, 30”L x 3”W x 8”H plywood wall plate, two 1.5”W x 94”H legs, three carabiners, swivel and rope hangers for quiet swinging. Holds up to 350 lbs. 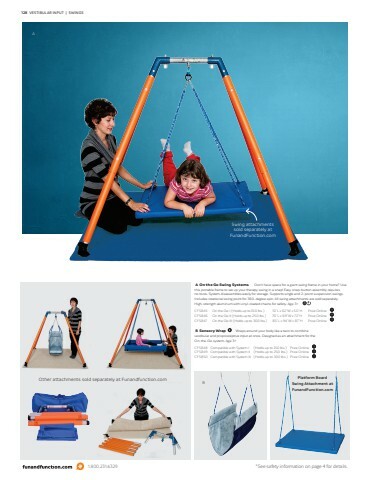 A sturdy indoor/outdoor swing frame to suspend 2-point suspension swings, including hammock chairs and thera- py swings. Once assembled, transporting the frame is not recommended. Holds up to 500 lbs. Weighs 97 lbs. 7’6”H x 7’2”W x 8’D. Made from rust-resistant metal with green powder-coated finish. This sturdy, heavy duty swing frame is designed for frequent use in your clinic or school. Setup takes just minutes. Simply attach a single or double point swing and your kids can swing away. Smooth hangers provide quiet swinging, which is especially soothing for those sen- sitive to noise. Rubber-tipped feet prevent slipping and A-frame design offers four-sided access to your swing. Suitable for indoor or outdoor use. Homestand I has stur- dier one-piece legs. Homestand II has folding legs that are more suited for traveling therapists or parents. Solid steel with weather-resistant coated finish.